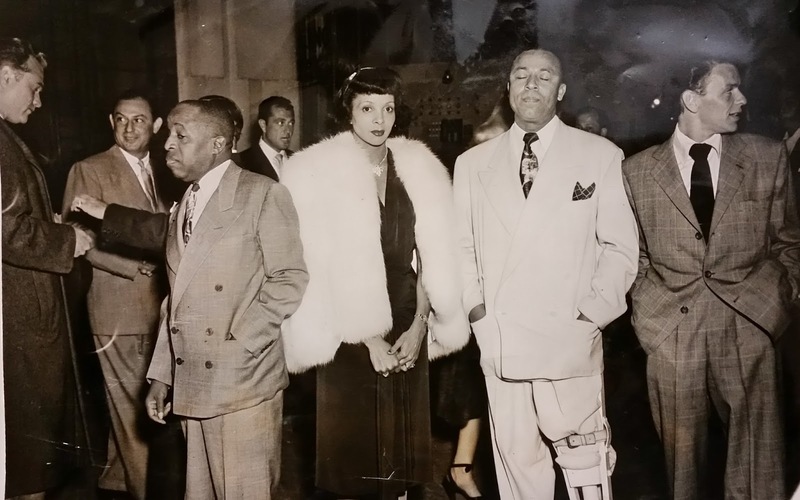 Introduction: This concludes the four-part post on pianist/singer Hadda Brooks by Rudy Martinez, a member of the advisory board for the Boyle Heights Historical Society. Rudy did a great deal of research and put together an interesting and informative history of a significant local musical figure. We hope you've enjoyed reading this history of a remarkable woman, who was raised and lived for a long time in Boyle Heights. Having left Modern Records, the Los Angeles-based label she put on the musical map, Hadda Brooks accepted, in late 1950, an offer to host a local weekly 15-minute television show (these were the norm in the early days of the medium) for 26 weeks. Beginning in the fall (the earliest listing found in the Los Angeles Times was on November 19), The Hadda Brooks Show aired live on Sunday nights from 9:15pm – 9:30pm on KLAC (now KCOP) Channel 13. Hadda would simply sing a few popular standards and chat between numbers during her time on the air. The show ran for its contractually obligated half a year, but the station might have rebroadcast some of the shows, as it continuously appeared in the Times television listings up to September 6, 1951. It should be noted here that Hazel Scott, an African American jazz singer and pianist is rightfully recognized as the first African American to host a television show. The Hazel Scott Show aired during the summer of 1950 in the east coast, but was canceled after two months. This would make the Hadda Brooks Show television’s longest running show hosted by an African American until 1956 when NBC debuted The Nat King Cole Show. Hadda Brooks with a group including the legendary singer Frank Sinatra, far right, and actor Red Skelton, far left. From the Walter L. Gordon Collection, Charles E. Young Research Library, University of California, Los Angeles. The April 1951 issue of Ebony, the monthly African American magazine, published an informative article on Hadda's show, and reported it was re-broadcast in San Francisco as a half-hour show. 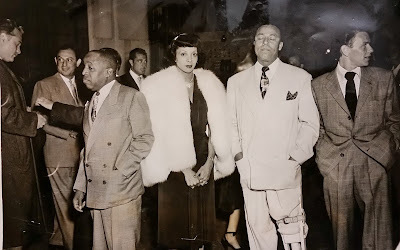 Unfortunately, no kinescopes or tapes of The Hadda Brooks Show are known to have survived, and beyond the San Francisco reference in the Ebony article, no listings or other references for her show in that area can be found. Regarding her recording career, Hadda attempted a last shot at the R&B market in early 1952, when she signed with Columbia's Okeh Records (Okeh was formed in the 1920s as a "race" label marketed towards blacks). Her first work under the contract was to record an interesting set of songs, such as a version of Johnny Ace's “My Song” and a rollicking, call-and-response number she wrote called “Jump Back Honey,” which ended up being covered by a number of other artists. But with the recordings again failing to make an impact on the charts, Hadda soon left the label. She then joined the Harlem Globetrotters during their first European tour in 1952 as part of the half-time entertainment program, giving Hadda the opportunity to perform in front of large and appreciative crowds all across Europe. Among her fondest memories was performing to thousands in a bullring in Spain and having an audience with Pope Pius XII at the Vatican. Hadda occasionally continued as part of the Harlem Globetrotters entertainment revue for a year or so when they returned to the United States. In addition, she continued performing on her own in different venues around the country, including a return to the Apollo Theater in 1953. By this time, Hadda had pretty much stopped swinging, rocking, or ridin' the boogie. Making a final course correction toward jazz and pop, she started specializing in torch songs and romantic standards, increasingly singing to white audiences as she performed mostly in supper clubs and cabarets. 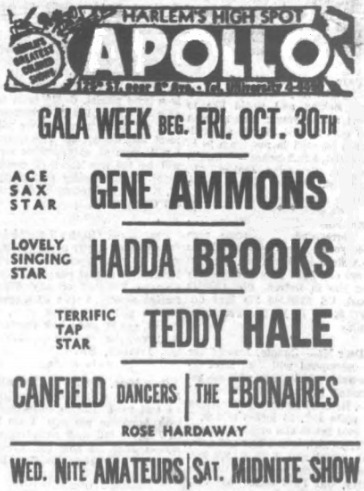 A newspaper advertisement for the famed Apollo Theatre in Harlem, New York, for the week of October 30 through November 6, 1953. Hadda had second billing below the great jazz tenor saxophonist Gene Ammons. From vocalgroupharmony.com. Surprisingly, she teamed-up with the Biharis again in early 1956 to record two albums as part of their budget line on their new Crown label. One was a collaboration with one of her musical heroes, legendary boogie pianist, Pete Johnson, and the other, released in 1957, was the balled-oriented album, Femme Fatale. Though it's now regarded as one of her best recordings, it was generally neglected by the public when it was released. By late 1956, Hadda left Modern Records for good. On Christmas Day, she married newspaper columnist Dan Brown in Las Vegas before starting a short stint at the Dunes Hotel, but they divorced before the end of 1957. Hadda has been one of those real good singers who never got that big break. One thing she's lacked is that “push” we've talked so often from record companies. I only came across this album thanks to her hard working hubby, ex-newsman, Don Brown. In 1957, Hadda’s father, John Hopgood passed away and was buried at Evergreen Cemetery in Boyle Heights next to his mother. At the time, Hadda's mother Goldie, her sister Kathryn, and her own family still lived at the family property in Boyle Heights. However, playing to smaller audiences by the late 1950s, Hadda began to spend more time away from Los Angeles. She spent a good part of 1958 touring Europe, and, by 1959, was residing in Hawaii, even performing at its historic 1959 induction ceremony as the 50th state. But, during most of the 1960s Hadda lived primarily in Australia. She was immediately popular with audiences "down under", as the Los Angeles Sentinel reported on November 10, 1960. The paper noted that Hadda was already settled in as the nightly house attraction at the 700-seat night club, The Embers, as well as again becoming a mainstay on television, doing five shows per week for GTV-Channel 9 in Melbourne. She continued, however, to make occasional trips back to Los Angeles to visit her family in Boyle Heights and perform at various events such as a local jazz & blues fest in 1965, where she shared the bill with a young Billy Preston. But, by 1969, Hadda was back living and performing in California. This stunning photo of Hadda appeared in the September 29, 1960 issue of The Age, a newspaper in Melbourne, Australia as promotional material for her GTV-9 television show and appearances at The Embers nightclub. Despite the lack of a rhythm section and propinquity of talkative diners, she was able to weave some sort of a spell with her deep, resonant tones, jazz-rooted phrasing and intelligent choice of ballads. Hadda Brooks is an attractive link to a half-remembered phase in intimate cabaret singing. In 1987, the Los Angeles City Directory listed her as residing at 3018 Boulder Street, located about a block-and-a-half southwest from the Malabar Street home of her childhood. The Boulder Street home may have also been owned by her family, as well. Though Hadda never had children, she enjoyed the company of her extended family. For example, the August 10, 1972 edition of the Sentinel published a brief article on the celebration of her mother Goldie's 83rd birthday at the Malabar Street home of Hadda's sister Kathryn. Though long retired, Hadda received a phone call in 1987 from talent agent Alan Eichler, who recently started to track down and even coax back on stage new clients consisting of “long-forgotten” or retired nightclub chanteuses like Ruth Brown and Anita O' Day. Timing again favored Hadda, as Los Angeles was just then beginning to experience the resurgence of a cabaret scene among a new generation of patrons. Her first gig in sixteen years, at Periono's Restaurant in Beverly Hills, garnered her a rave review in the April 23, 1987 issue of the Times. Hadda was now “unretired” and newly discovered by a younger demographic that kept her busy performing in nightclubs, music festivals and occasional television appearances around the country for years to come. The cover for Hadda's album, Romance in the Dark. The photo is a still from the film In a Lonely Place (1950), starring Humphrey Bogart, who is second from the left. Co-star Gloria Grahame is next to Bogart. In 1995, a half-century after she released her first record and now in the digital era of compact discs, Hadda released a new album for the Virgin label titled, Time Was When. This was followed later that year by the contribution of her original "LA Christmas Blues" on a holiday anthology, Even Santa Gets the Blues. The next year Virgin released That’s My Desire, a 25-track retrospective of her recordings for Modern during the 1940s and 1950s. In 1996 Hadda celebrated her 80th birthday at Johnny Depp's Viper Room on Sunset Boulevard in Hollywood, performing two full shows. Moreover, she was not entirely done with films. In 1995 came the release of the Sean Penn-directed film, The Crossing Guard, starring Jack Nicholson and which featured Hadda in a brief cameo as (no surprise here) a singing, piano player in a cafe. In the next few years she appeared in small roles in two more movies, The Thirteenth Floor (1999), and John John in the Sky (2001). Hadda was also the subject of the documentary Hadda Brooks: Queen of the Boogie made by filmmakers Austin Young and Barry Pett. The film was screened locally at the 2007 Silver Lake Film Festival, but, as far as can be determined, it has yet to be commercially released or made available on DVD. In 1996, feeling her old neighborhood was less safe and perhaps not the best place for an 80-year-old who played late-night gigs, Hadda left Boyle Heights and moved to a large assisted-living apartment in Hollywood on Franklin Avenue (a friend and neighbor was singer Anita O’ Day). In the meantime, with help from her manager, she still performed locally at some of the city’s trendiest nightclubs. She also gave frequent magazine and television interviews and was an honoree at the LA Pride parade in West Hollywood. Locally, Los Angeles Magazine proclaimed that Hadda had “once again cast her spell on Los Angeles.” She also transfixed New York City, earning a rave review in the July 2001 Village Voice for an appearance at the noted jazz venue, Joe's Pub. Hadda on the far right at the 1987 Rhythm and Blues Foundation Pioneer Awards, of which she was a recipient. 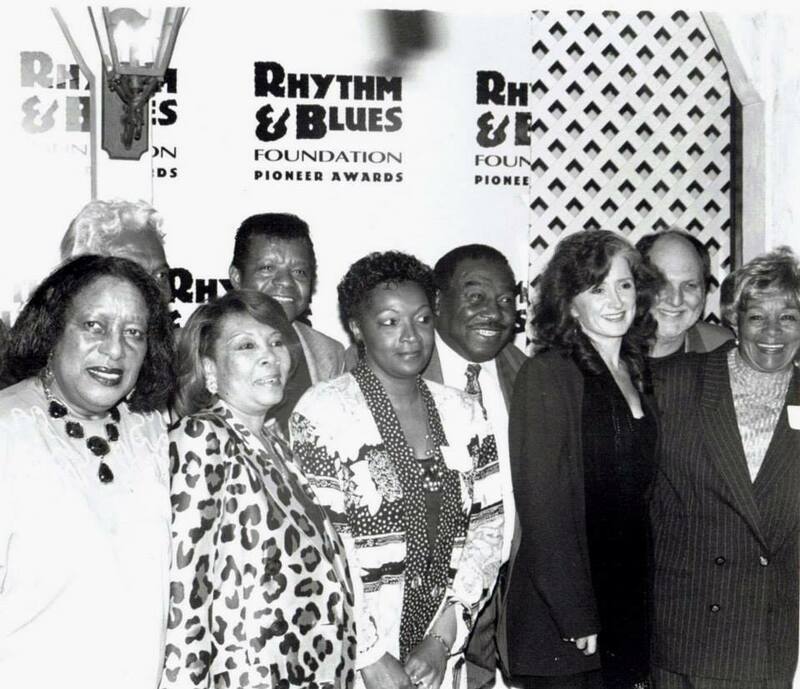 Presenter and singer Bonnie Raitt is to Hadda's left and musician Billy Vera is between them in the back. From Vera's Facebook page. Meanwhile, the Modern Music Company was essentially one label, the Kent imprint, by the time it ceased operations around 1980. From the time this trailblazing record label released its very first record in 1945 until it went out of business, it had amassed one of largest and most important music catalogs of any label in the post-war era, which included a considerable amount of R&B, blues, doo-wop, soul, and even some early rockabilly classics. In 1995, Ace Records, a large European label specializing in reissues, purchased the catalog of Modern Music and all of its subsidiary labels. Ace even managed to find some of Hadda’s music that was thought to be lost decades ago, such as her heartbreaking rendition of "Why Did You Say We’re Through", which was on the reverse of an old Smokey Hogg acetate. As well as reissuing much of the Modern Music archives in handsome packaging, which often included generous photos and informative essays on the artists, Ace's arrangements made it possible to pay artists royalties, including to Hadda Brooks. By the late Nineties, Hadda Brooks, the first lady of Modern Music, finally began to receive regular royalty payments for the music she recorded. The last nightclub engagement for Hadda Brooks was in the Los Feliz neighborhood of Los Angeles in September 2002. Just two months later, on November 21, after undergoing open-heart surgery, Hadda passed away at age 86 at White Memorial Hospital in Boyle Heights. The hospital is only two miles from the home where she was born and lived for a large part of her life. Hadda was cremated and her ashes were scattered. 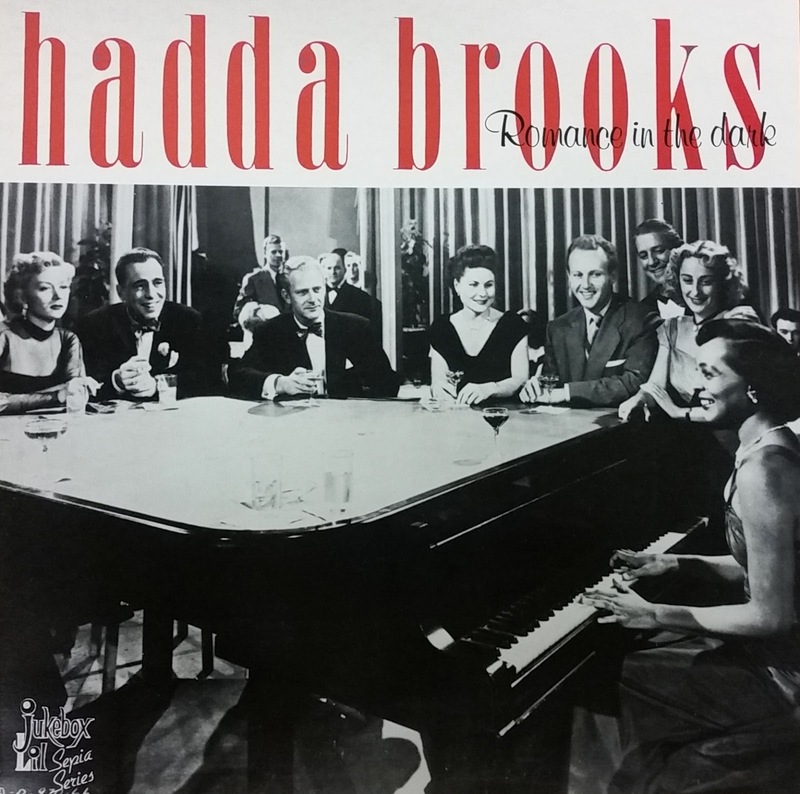 Hadda Brooks' music, however, lives on and, hopefully, generations to come will enjoy a body work that demonstrates that she made a significant contribution to the development and production of a uniquely American music. To see Hadda on film, check out this link to 10-minute 1948 movie featuring her called Boogie Woogie Blues. Scroll down to the bottom of the page to see the video, which was uploaded from the Hamon Arts Library of the Meadows School of the Arts at Southern Methodist University. Enjoy! Hadda's beautiful performance of the song, "I Hadn't Anyone, 'til You," is a highlight of the Bogart film noir classic, "In a Lonely Place." The film airs periodically on Turner Classic Films - highly recommended. Thanks, Peter, for the comment and the heads-up about Hadda's performance in "In a Lonely Place," which Rudy Martinez briefly mentioned in part 3.